Is there a Way to Block ADs on YouTube? As the largest online video sharing website in the world, YouTube has received billions of clicks and views. Nowadays, for either monetizing their content or other reasons, many popular YouTubers have added dozens of autoplay commercials on their videos. As a result, we have been forced to watch the ads before we could watch the real video content. This has resulted an opposite effect. Many people are looking for ways to block ads on YouTube videos. Well, in this guide, we would like to introduce you several effective ways to block ads on YouTube on different devices, including your computer, iOS devices and Android devices. Many people would wonder whether it’s illegal to block ads on YouTube since they have been reminded by their browsers like Chrome or Firfox that the ads on YouTube have been disabled. And they might have been to disable the ads-blocker tools to enable the autoplay of ads. Actually, there is no legal issue on blocking ads on YouTube. Not a single law in any country right now has forbidden the use of ads blocking tools. Then, how to block ads on YouTube? Below are some effective ways for you to block ads on YouTube on your computer, be it Mac or Microsoft Windows. Formerly known as YouTube Red, YouTube Premium is a paid streaming subscription service that provides advertising-free streaming of all videos hosted by YouTube, exclusive original content produced in collaboration with the site’s creators, as well as offline playback and playback of videos on mobile devices. A YouTube Premium subscription allows users to watch videos on YouTube without advertisements across the website and its mobile apps, including the dedicated YouTube Music, YouTube Gaming, and YouTube Kids apps. The subscription cost is $11.99 from its original$9.99. 1. Open the YouTube Premium sign-up page. Go to https://www.youtube.com/premium in your computer’s web browser. 2. Click the blue “TRY IT FREE” button and log in with your Google account. 3. Enter your payment details. Type your card number, card expiration date, and card security code into the labeled text fields, then enter your billing address as it appears on your bank statements in the “Billing address” text box. 4. Click the “Buy” button at the bottom. The free tiral version of YouTube Premium will last for 1 month. It will cost you $11.99 per month afterwards. 5. If you clicked “GET YOUTUBE PREMIUM” instead of “TRY IT FREE”, you will be billed upon clicking BUY. 1. Open up a YouTube video (any will do). Then, no more ads will pop up during YouTube video watching. Turning to ads blocker plugin would be another wonderful way to block ads on YouTube on your computer. You could install ads blocker addons to your browser including Firefox, Chrome, Windows Edge to block ads in YouTube video. There are quite great number of ads blocker plugins like Adblock Plus, AdBlock, AdGuard, etc. The below steps would briefly show you how to install ads blocker plugin to your browser. The process might vary a little for Firefox, Chrome and other browsers. 1. Click the browser icon on your browser to enter the plugin market. 2. Search an ads blocker like Adblock Plus extension. 3. Click Add to Chrome (or Firefox, your browser) button. 4. Confirm the installation. The plugin will start to install immediately. Some iOS device owners also want to know how to block ads on YouTube app on iPhone, iPad and iPod. Actually, it is extremely easy to block ads on YouTube apps on iOS devices. You could upgrade to the YouTube Premium plan as mentioned above to block ads on YouTube app on iOS iPhone, iPad, and iPod. Also, you could try to make use of some ads blocker app on iOS devices as well to block ads on YouTube iPhone, iPad and iPod. Together with Settings assistance, you could easily remove or block ads on iOS devices. Follow the below steps to learn how to block ads on YouTube app on iOS devices. 1. Download your Content Blocker of choice from the App Store, e.g. Adblock Browser. Or, you could search adblock or ads blocker in App Store to find one. 2. Navigate to YouTube in the Adblock Browser, and verify that the ads are disabled. 3. If you prefer using Safari to watch YouTube videos, open the Settings app. 4. Go to Safari > Content Blockers. 5. Enable the blockers of your choice. This will help you easily block ads from YouTube app on iPhone, iPad and iPod. If you are an Android smartphone or tablet user, how to block YouTube ads on Android? Well, don’t worry. It would be even easier for you to block ads on YouTube app on Android. There are actually 4 ways to block ads on YouTube on Android devices: upgrade your YouTube subscription to Premium, root your Android device, install a browser that has ads blocker tool built in, and turn to ads blocker app. The best way to watch YouTube videos without ads on an Android Device is to install a browser that has a built-in ad blocker like Adblock Browser for Android. Therefore, you don’t need to root your device or make any other changes. 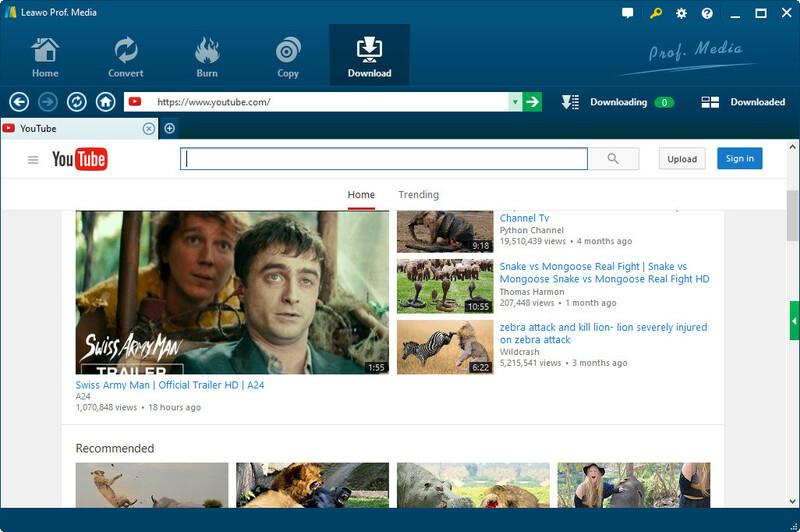 All you need to do is download the new browser and use it to view YouTube videos. 1. Open the Google Play Store. 2. Search Adblock Browser for Android and click the magnifying glass. 3. Click Install button after you find the target app. 4. Then click the Open button after installation. 5. Click only one more step. 6. Read the information about how the ad blocker works, and click Finish button. 7. Navigate to YouTube in the Adblock Browser for Android app. 8. Verify that the ads are disabled. Note: Your Android device may still try to play YouTube videos in the YouTube app after installing Adblock Browser for Android. If this happens, navigate to Settings > Apps or Applications > YouTube, and tap Clear Defaults or Clear Data. Actually, you could try to download YouTube videos to your computer for offline ads-free YouTube video watching. Generally speaking, most YouTube video downloader apps won’t include the ads. Therefore, the downloaded YouTube videos will be ads-free. To download YouTube videos, Leawo Video Downloader, a professional online video downloader program that could download video from 1000+ sites, could be your best choice. It not only downloads videos from YouTube, but also downloads videos from Facebook, Veoh, VEVO, etc. The interesting thing is that it offers multiple download options of target YouTube video in different resolutions, formats and quality for you to download. 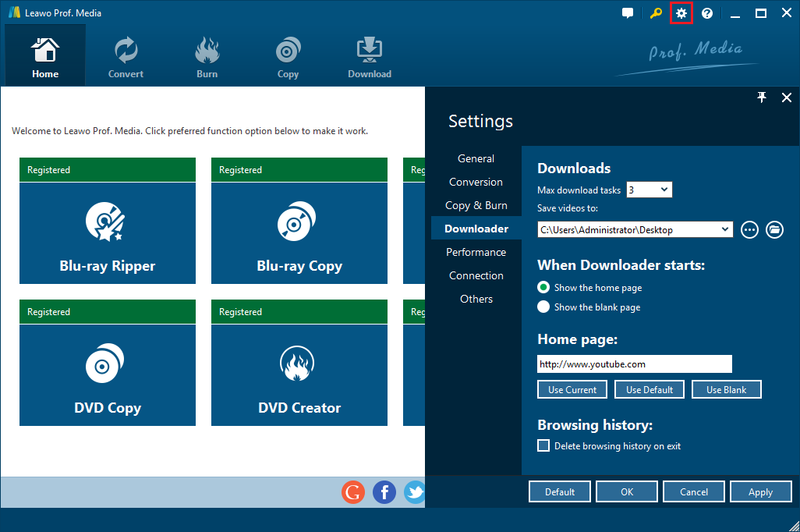 Launch Leawo Video Downloader (a module built in Leawo Prof. Media). On the top-right corner, click the wheel icon and then navigate to the “Downloader” tab to set output directory in the “Save videos to” box. Open the “Download” module and then make use of the internal browser to browse the target YouTube video you want to download. Once you’ve reached the target video page, click the video to see if it is exactly what you want. Then, on the right sidebar, you could see multiple download options, which are in different resolutions, quality and formats. Choose the one you want to download. Select the video you want to download and then click the download icon to start downloading YouTube video. Then, this YouTube video downloader would start to download YouTube videos. All downloading tasks would be viewable under the “Downloading” tab. You could download multiple YouTube videos within Leawo Video Downloader at the same time. After downloading, you could see downloaded YouTube videos under the “Downloaded” tab. The downloaded YouTube videos will all be ads-free.